Karina is an international keynote speaker, author, computer programmer and professional athlete. 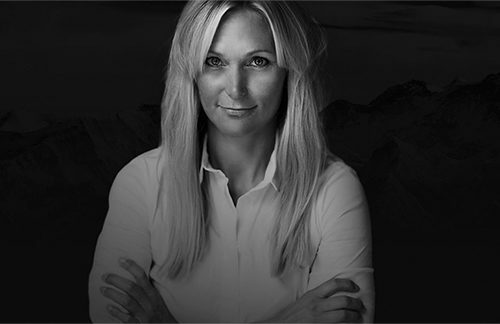 For over a decade Karina was a professional athlete for Red Bull performing both as a big mountain skier and Base jumper. Karina is a female pioneer, being the first woman in the world to perform a skibase. Karina’s life was turned upside down when she had a near fatal skydiving accident in 2006 leaving her in a wheelchair with the prediction of never to walk again. She endured 20 surgeries and has had to relearn to walk, but she has returned to skiing and is living life to the fullest today. Her autobiography ‘The Wonderful Feeling of Fear’ is internationally published and her speech is part of the exclusive group of TedX talks. Karina’s coaching skills comes from a background in Neuro Linguistic Programming, Active Commitment Therapy and working as a performance consultant since 2012. Her clients range from professional athletes to top business executives. Her ability to push boundaries, stay focused and power to re-mobilize through hardship, are core qualities she transmits through her coaching and speaking.